Lidding film with peel and reseal labels is rising in popularity due to the convenience they offer to customers. A customer is able to simply pull the label back to expose the product and press the label back down to reseal until it is needed again. While they are commonly seen on food items, they are an option for healthcare, cosmetic, garden, industrial, and additional types of products. Films and labels may have a surface printed or a reverse print design along with multiple layers of protection. 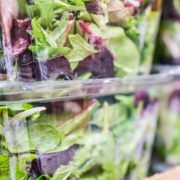 In the food industry, lidding films with peel and reseal labels are viewable in every area including produce, frozen foods, dry packaging, and meats. This is because of its effectiveness along with the number of beneficial qualities providers are able to include in the design. Certain inks prevent changes in appearance as well as to ensure the printed graphics remain intact when exposed to varying temperatures. The variety of offered design options makes lidding film with peel and reseal labels a viable choice in several markets. What Are the Advantages of Lidding Films with Peel and Reseal Labels? These qualities are often combined for frozen food trays or even with produce to ensure proper safety and the utmost convenience for customers. Other lidding films with peel and reseal labels are resistant from moistures or oils to protect the product in areas such as mechanics or industrial settings. Another advantage is a longer product lifespan, as perishables remain sanitized, since it experiences minimal exposure to the outside environment. They improve freshness since products such as dried snacks are less likely to go stale in the packaging. Products that have been designed to reseal make it easier to carry, use, and store. At Flexo-Graphics, we offer several options to ensure you get the right peel and reseal labels for your lidding films. We specialize in roll to roll labels, which can be added to your packaging. Contact us today to learn more about available labels options!